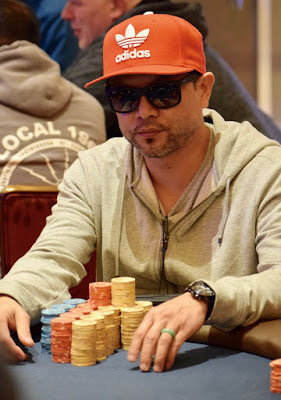 A series of preflop bets between Tom Spruitenberg and Ryan Pham end with a shove from Spruitenberg and a call from Pham for what looks be just about even stacks of around 40BB each. Pham (above) has pocket Nines. The board runs out T-5-T-3 3 and now let's get the counts from the dealer. Pham to 700,000 and the chiplead.